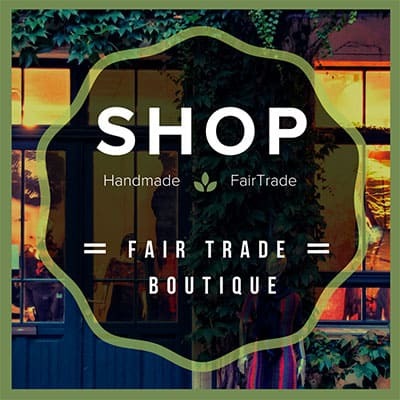 We tend to seek out ecotourism adventures wherever we travel. 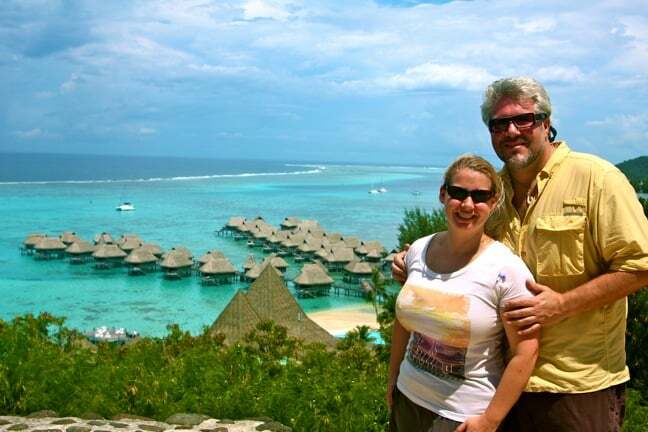 But such is the mystical allure of Tahiti that even we were tempted to simply hang out in our luxurious over-water bungalow at the Sofitel Moorea Ia Ora Beach Resort and embrace the R&R approach to paradise. It would’ve been easy, given that the resort’s waters were a marine sanctuary, with myriad coral, fish and spotted rays all around us. 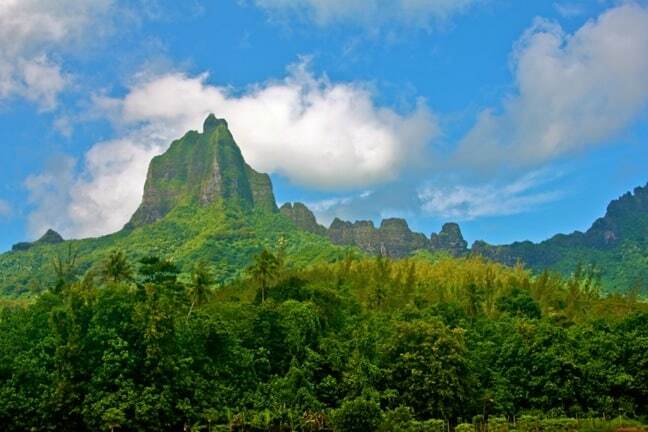 But our insatiable curiosity ultimately got the better of us, and I think these photos of Moorea show why leaving the comfort of your hotel and exploring the island’s interior via a 4×4 Safari Tour will help you to better appreciate the beauty of the people and landscapes of Tahiti. After getting picked up around sunrise at the Sofitel by our Albert Transport guide, Eloy Martinez, in a 4×4 safari vehicle, we made our way to another hotel to pick up a young couple from Texas. 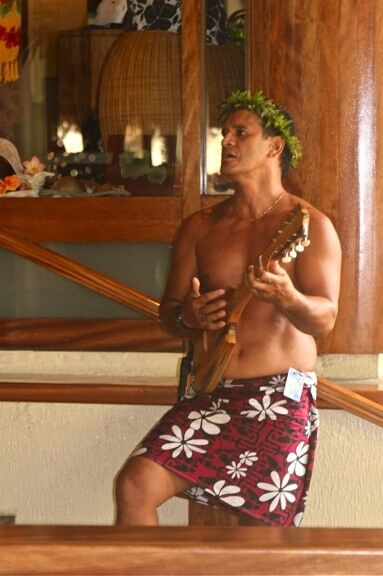 While we waited, we were treated to a Polynesian serenade on ukelele, which proved a lovely way to wake up as we sipped our coffee. We understood the need for a 4×4 almost immediately, as our guide ventured off the main road around the island and headed up a steep incline on the winding “Magic Mountain” trail, which seemed FAR too narrow to accommodate two vehicles at once. 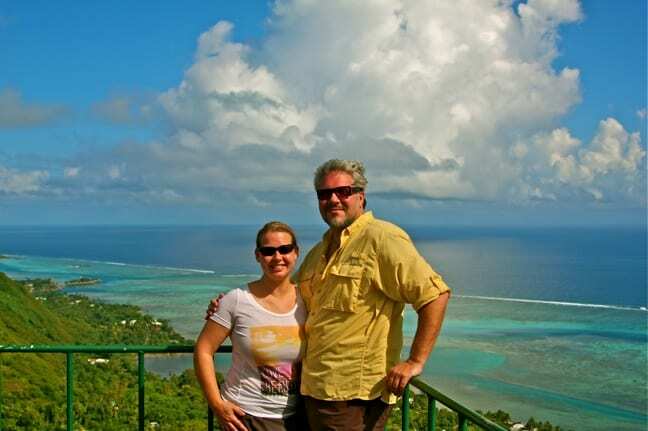 At the top, we were treated to an incredible view of the ocean, soaking in the stunning array of blues for which these islands are known. The intense heat suddenly gave way to an intense (but thankfully brief) morning shower, which passed over us mere moments after it began. 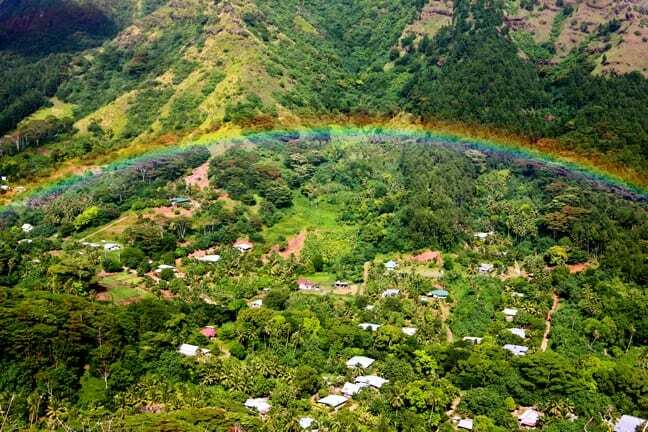 In its wake, this remarkably vivid rainbow appeared over the verdant green valley, which was the caldera of a long-dormant volcano. It was an incredibly lovely way to start our first full day in Tahiti! 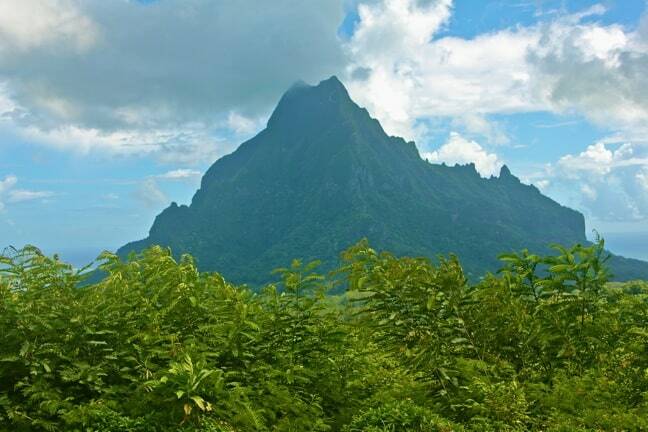 As we traversed the interior of Moorea, the jagged cliffs of Mount Tohivea loomed large above us, dominating the landscape. 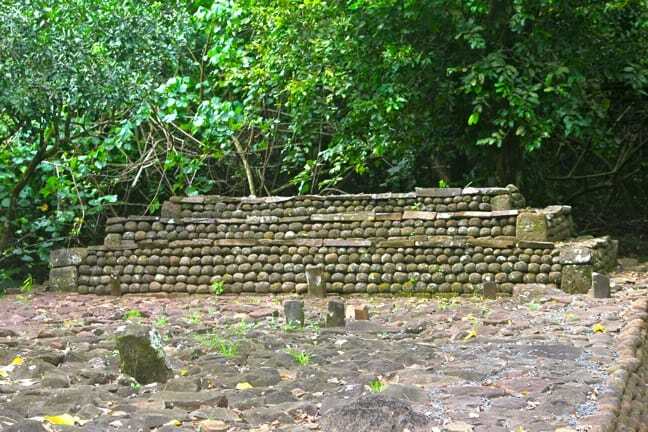 The most prominent peak– the cathedral-like Moua Roa– is referred to as “Bali Hai Mountain,” and is widely believed to be the inspiration for the mythical Bali Hai in James Michener’s Tales of the South Pacific. 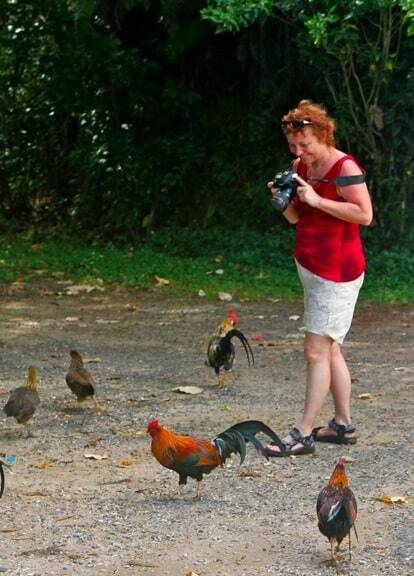 An interesting trivial tidbit nobody tells you about Moorea: There are free-range chickens EVERYWHERE! With no natural predators on the island, our fine-feathered friends were as ubiquitous as pigeons in Central Park. When we weren’t distracted by the flock of chickens, we were checking out the expansive view afforded by the famous Belvedere Lookout. 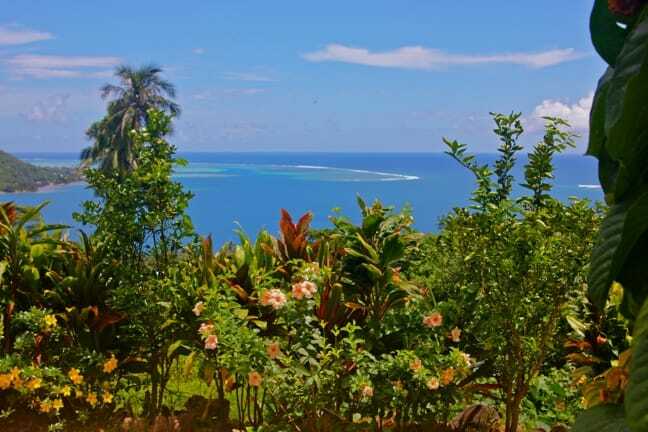 From here, you get a panoramic vista encompassing the dynamic ridge of Mount Tohivea, the imposing summit of Mount Rotui, Opunohu Bay and Cook’s Bay (a.k.a. Pao Pao Bay, named for the village there). It’s arguably the best scenery in all of Tahiti. Our next stop was at the Ahu-O-Mahine Marae in Opunohu. A marae (which means cleared of weeds and trees) is a sacred communal place that serves religious and social purposes in Polynesian societies. 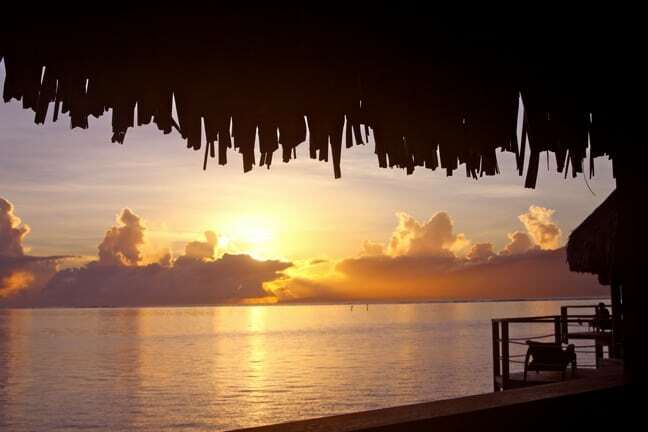 In Tahiti, marae were historically dedicated to specific dieties. Discovered in 1925, this marae was excavated in 1960 and was fully restored a few years later. Right beside the marae, we spotted many of these Giant African Snails hanging out in the shade from the midday sun. These snails were introduced to Tahiti as a slow-moving source of food in 1969, but when they developed a taste for the islands’ fruits and veggies, scientists brought in Rosy Wolf Snails (a.k.a. Cannibal Snails) to eat the African giants. Sadly, the Rosy Wolf preferred the taste of Tahiti’s endemic snails, which were nearly driven to extinction. 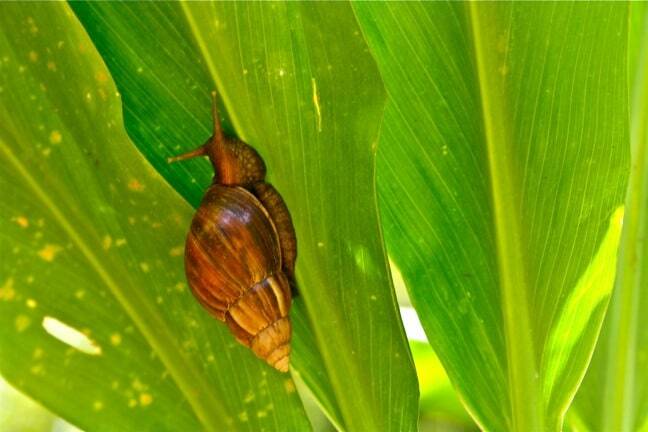 Now, with the Rosy Wolf largely eradicated, there are concerted efforts to re-introduce endemic tree snails in Moorea. 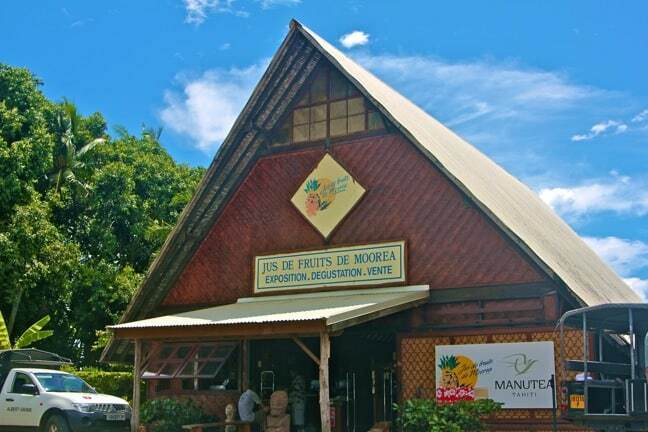 The next stop on the tour took us to Manutea Tahiti, where the islands’ delicious tropical fruits are turned into delicious liqueurs that pack a surprising punch. 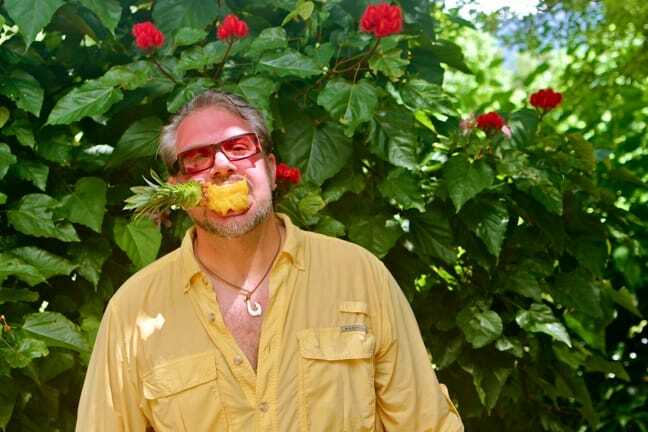 Upon arrival, we bellied up to the bar in back, where a lovely lass plied us with pineapple, coconut, mango, papaya and other juices mixed with rum distilled in-house. We’re lightweight drinkers, and after a half-dozen mini-shots we were feeling no pain. So we headed outside to see truckloads of locally-grown fruits being delivered to the Manutea Tahiti warehouse. One kindly farmer gave us a few of his pamplemousse (French for grapefruit) for free when he saw us taking photos. 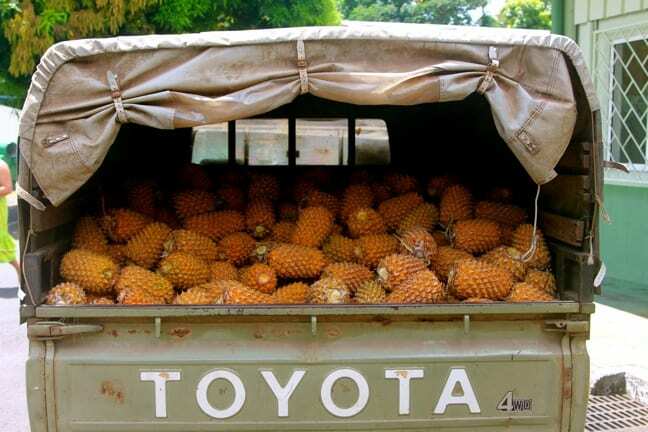 But it was this Toyota stuffed with fresh pineapples straight from the co-op plantation that really got me salivating. Our last stop of the day had us heading back up into the hills above the coast, to the family-owned Moorea Tropical Garden. 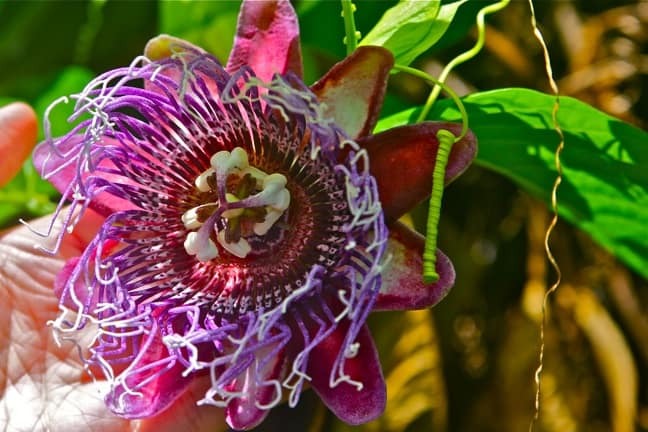 This quaint little botanical garden is clearly a labor of love, with a technical rainbow of tropical colors bursting out everywhere you look. From tropical flowers and fruits to a whole greenhouse full of Tahitian Vanilla, it was the closest thing to Eden we saw during our time on the island. By this time our water bottles were empty and we were all dirty and sweaty from walking around in the sweltering heat of the midday sun. So we took a few minutes to cool off in the shade of the garden’s picnic area, grabbing some fresh squeezed pineapple juice and dried bananas from their snack bar. At this point, we were getting hungry! Finally, near the end of our journey, Eloy surprised us with the pineapple he’d picked at the co-op early in the day. 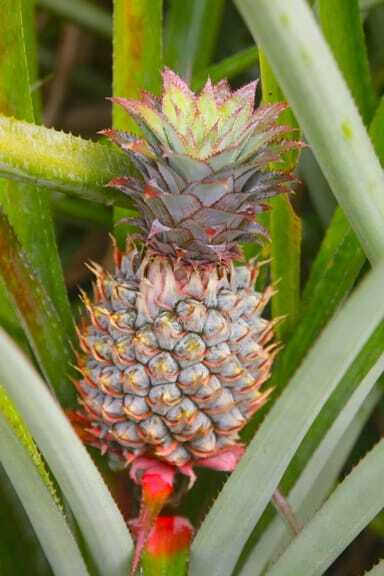 And since I returned to the Jeep after everyone else had already eaten their fill, I was treated to the pineapple’s luscious center, which was easily the sweetest, juiciest piece of fruit I’ve ever had. Just looking at this photo has my mouth watering from the memory.